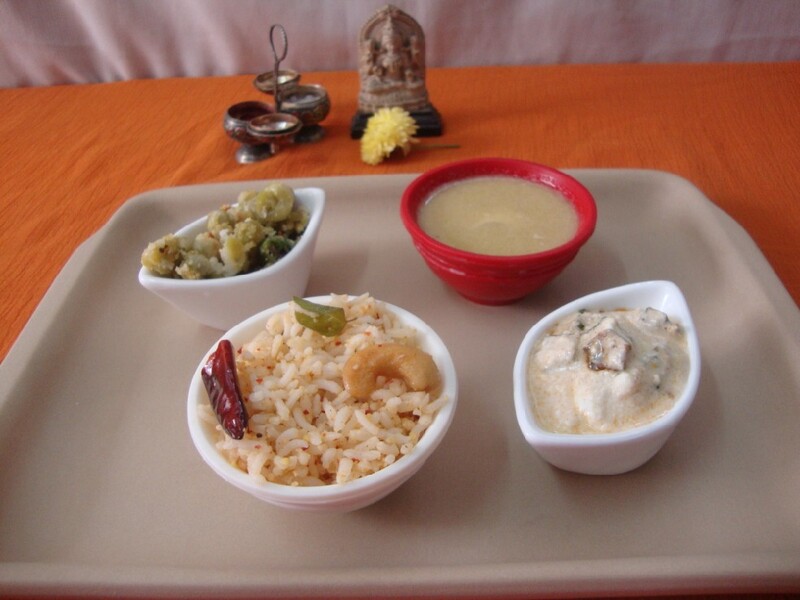 For Navaratri Pooja’s Day 4 neivedyam were Ellu Sadam / Sesame Rice, Pattani Sundal and Apple Masoor Dal Payasam. Being a Saturday and 4th day of the Navaratri, the next three days are for worshipping Lakshmi. 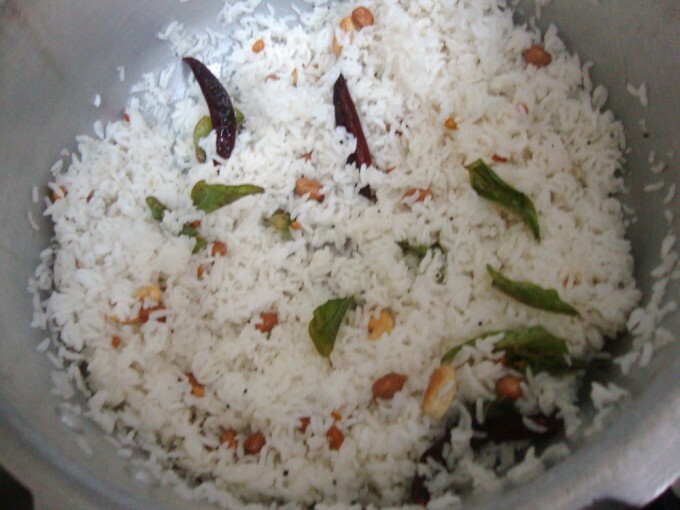 For the next three days, the rice offered has to be shades of white, and I was suggested to make Ellu Sadam and Payasam. Apart from making a neivedyam with rice, it’s also mandatory to offer sweet, mostly made with jaggary and lentil. These two conditions made me choose Masoor dal and Toor dal. 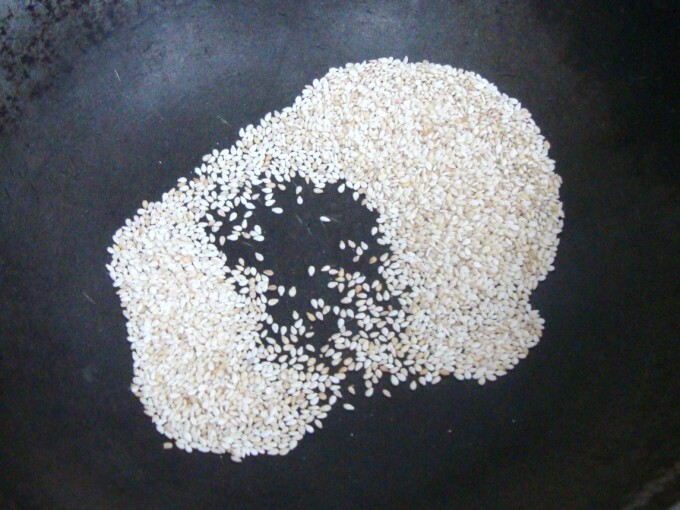 Though I have heard much about Ellu Sadam / Sesame Rice, it’s something I am yet to make at home. 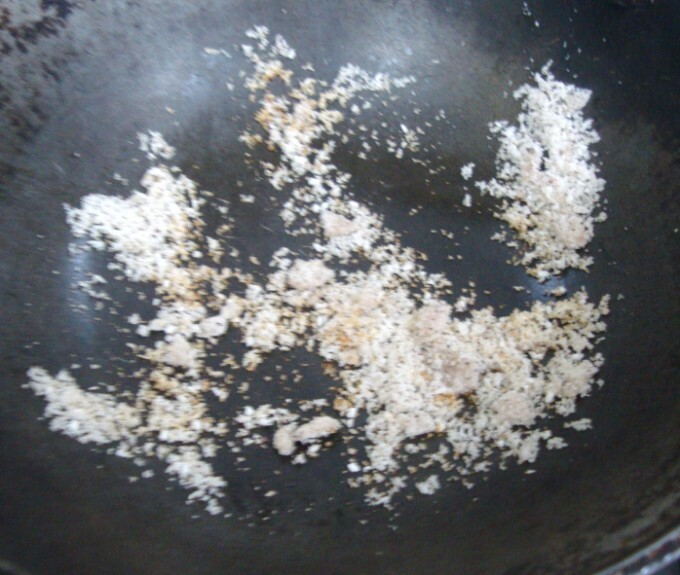 I referred couple of cookbooks and online to see the different ways one can make this mixed rice. This is one of those quick ones that can get done in a jiffy. I read Kamala’s and Nags and saw that it’s mostly done as you would do with mixed rice dishes. Since this rice was going to be served for the lunch as well, plus to make sure I include those lentils, I tweaked it a bit to arrive at this flovoursome Rice dish. If you are not used to eating roasted sesame, this might be little strong in flavour but surely something that will reach out to you soon. 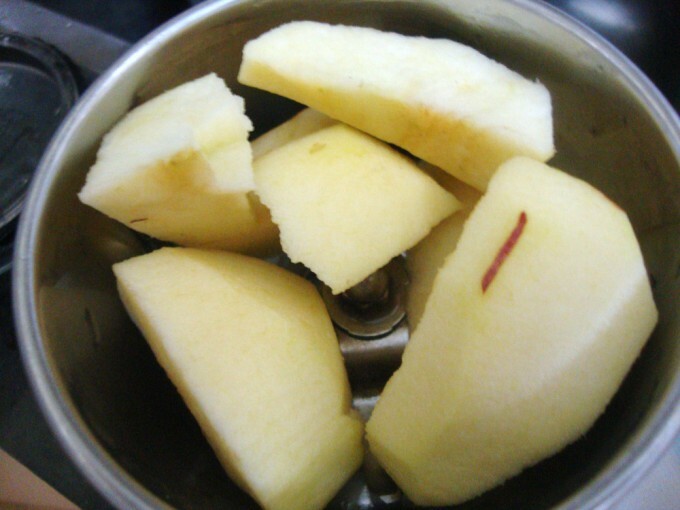 Knowing that I ought to make a Payasam with Jaggary, including lentil, I decided to make a new one with Apple. So came into existence a new dish altogether. I must say it turned out very well. As with most new dishes I always want to share anything new that I make, so packed my lunch for office and got my cook taste it. She was pleasantly surprised knowing that apple went into the payasam. There is nothing that makes me more happy, than seeing the facial expression changing when tasting a new dish and I love doing that! For the Ellu Sadam, I make Okra Raitha, a raitha I read long ago and had bookmarked to make ever since. I still remember the surprise I got when I read that one can make such a simple raitha, especially with Lady’s finger! By luck, it looked as if I arrived at the most perfect combination. 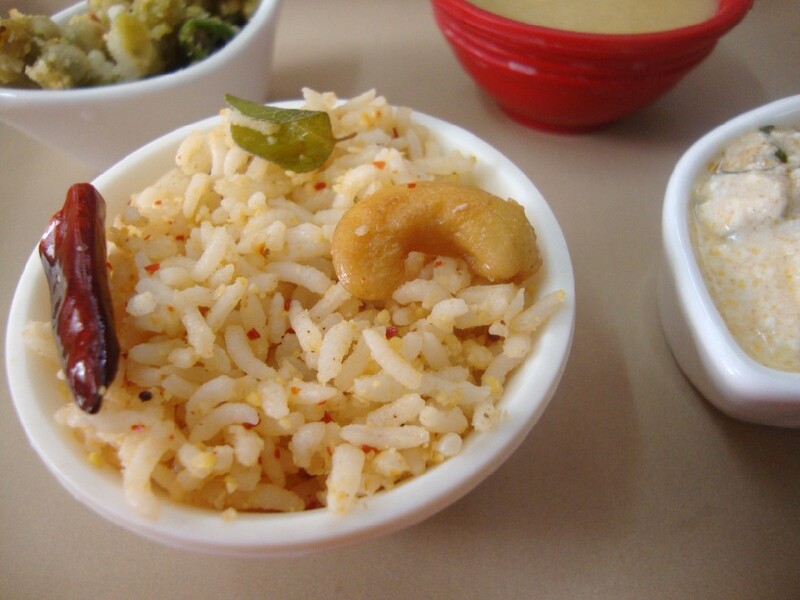 Sesame Rice with Vendaikai Thayir Pachadi / Bhindi Raitha rocked! 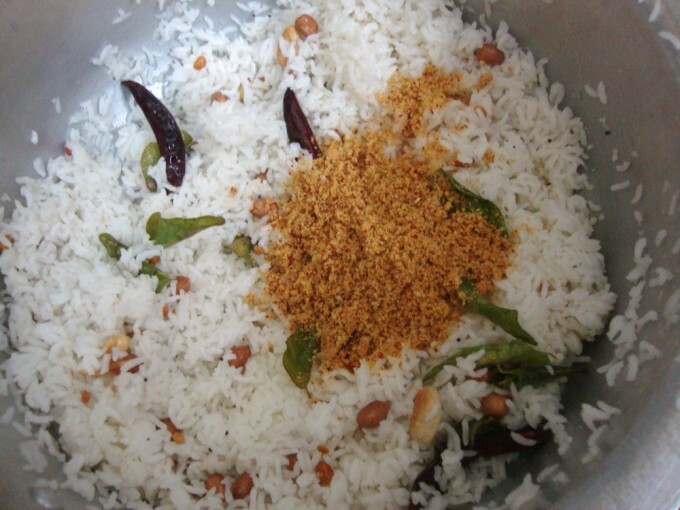 Wash and soak the rice for 15 – 20 mins. Pressure cook for 3 whistles. 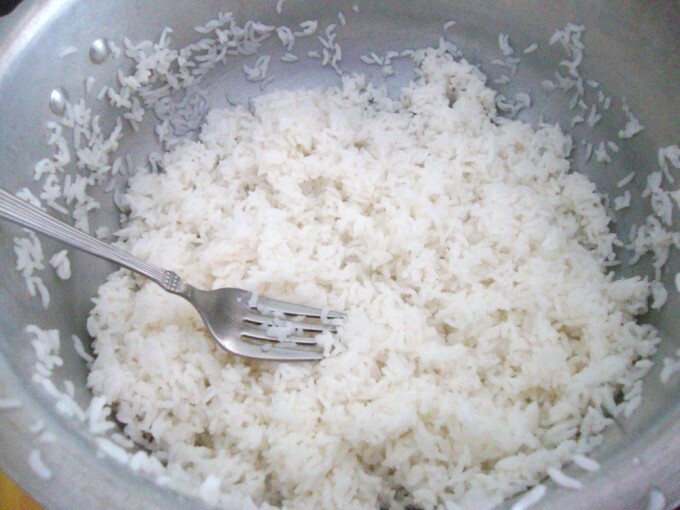 Remove 1 & 1/2 cups rice and allow to cook. 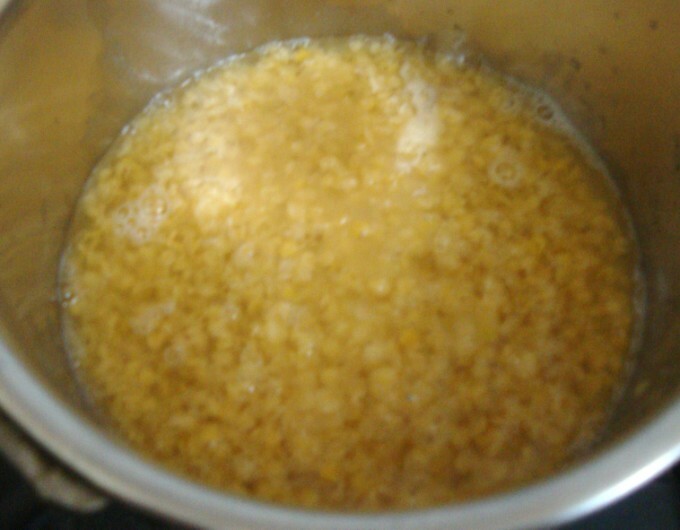 Mix in oil for the grains to separate. 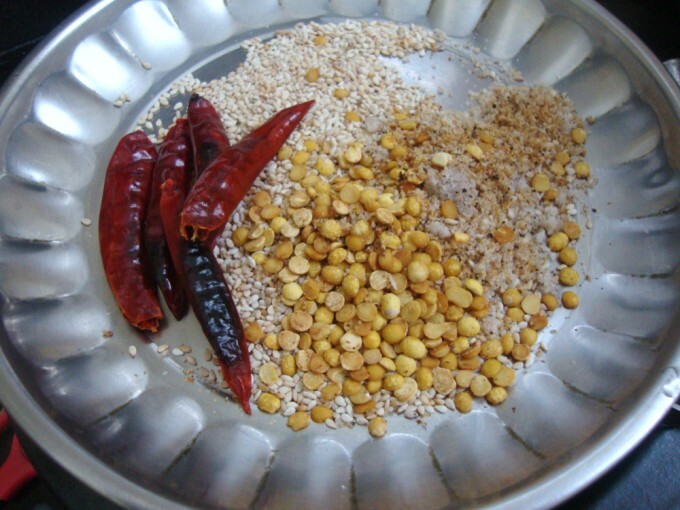 For the Spice powder, dry roast all the ingredients separately, grind to a smooth powder once it is cooled. Keep it aside. 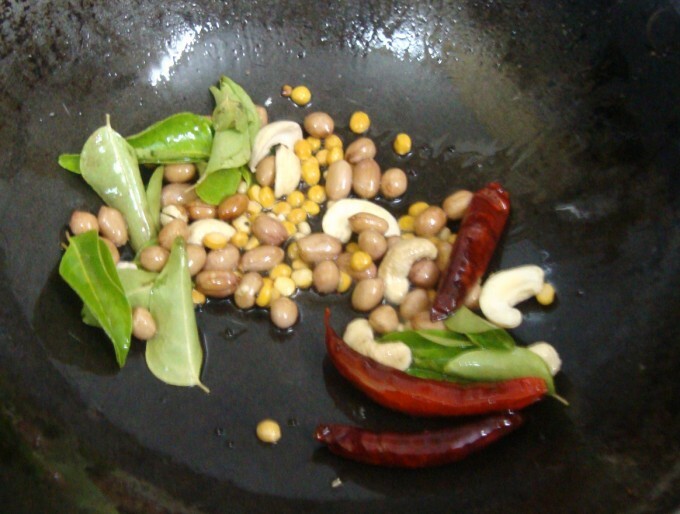 In a pan, heat oil, season with mustard, urad dal, curry leaves, chillies, peanuts. Saute well. When it is done, add this mix to the cooked rice and mix well. Then add the spice powder and combine everything. Serve after offering to God! Wash and wipe the okra clean of water, this will not make it sticky. Chop into fine pieces. Allow it to dry. 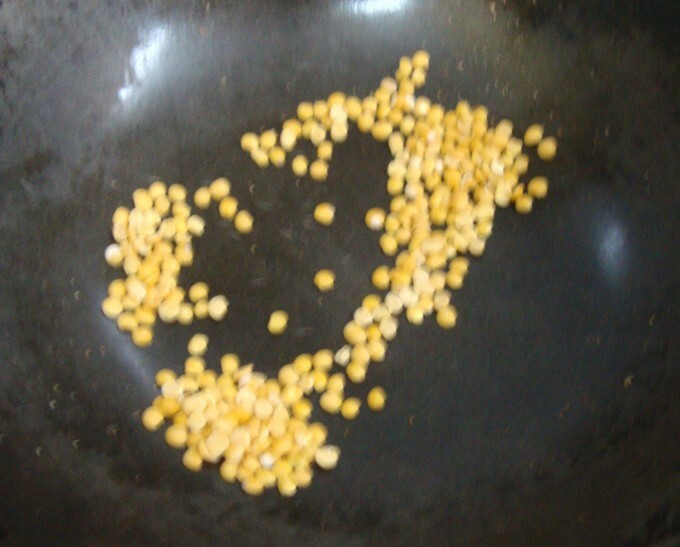 Heat a pan with oil, add mustard, urad dal and saute. Then add the okra and saute well. Sprinkle the salt and chili powder. Mix and cook in sim till it turns crispy. 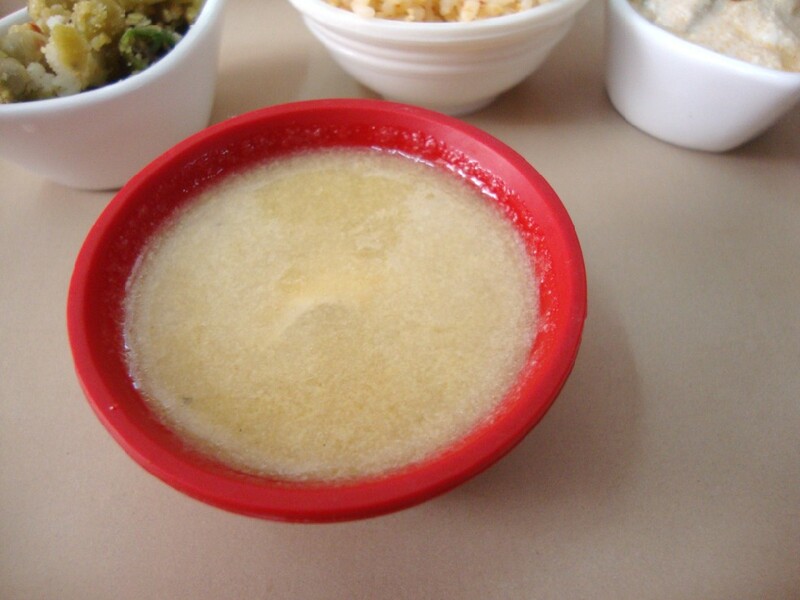 Once done, allow to to cool, mix into curds and serve with Ellu Sadam. Wash and soak the peas overnight. Pressure cook for 2 -3 whistles till done. 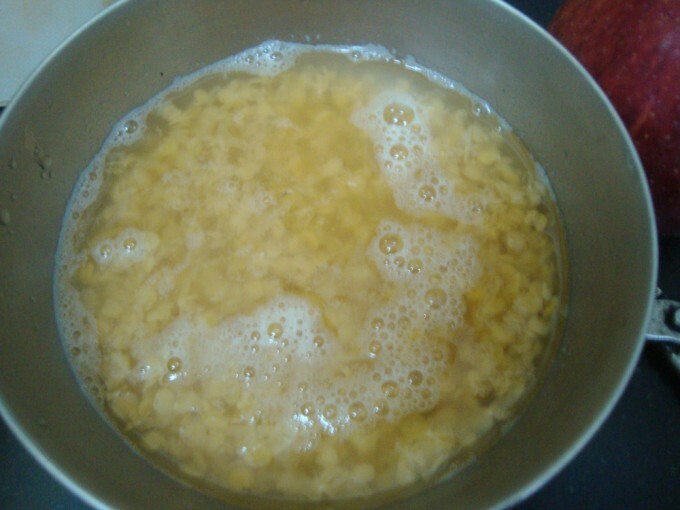 Once the pressure falls, cook in open after adding salt. Heat a non stick pan with oil, season with mustard, Urad dal, curry leaves, red chilies, When the mustard pops, add the cooked peas, simmer for 5 mins. When it coated well with the seasoning, add the spice powder and mix well. Just before switching off the flame, add the grated coconut to the peas and mix well. Wash and soak masoor dal for 10 mins. Microwave for 10 mins in a micro safe bowl. 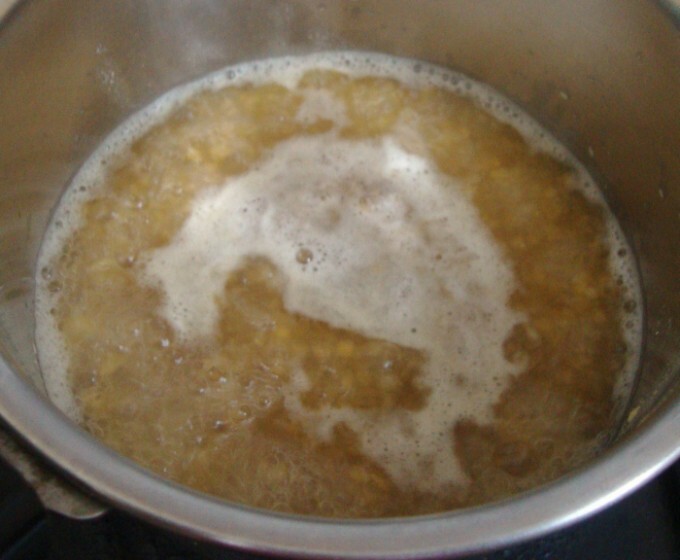 The dal should still retain it’s shape and not be mushy. Melt jaggary and remove impurities if any. In a bowl, add the cooked dal along with jaggary, cardamom. Bring to boil. 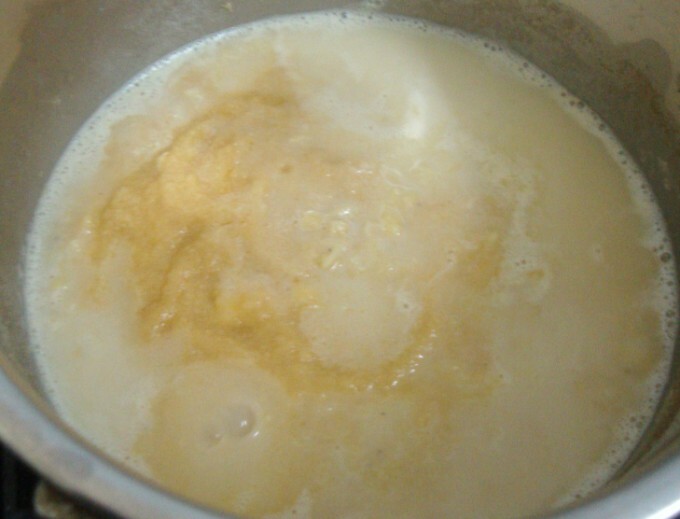 Add boiled milk and simmer. Meanwhile, peel the apple skin and puree it. 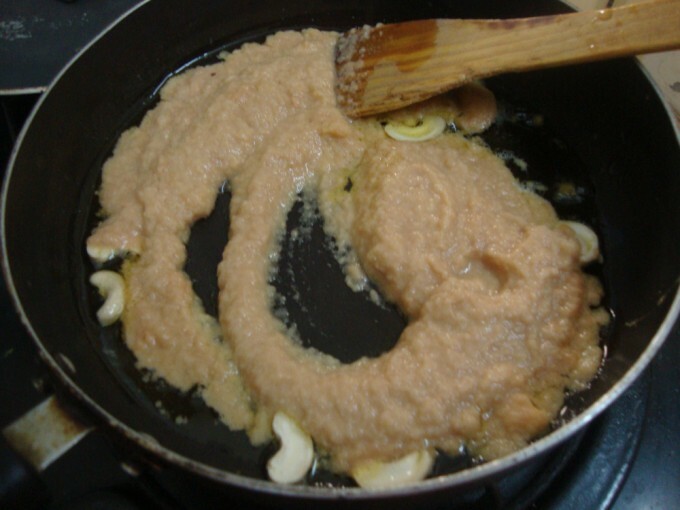 In a non stick pan, add ghee, roast the cashew nuts, once they turn colour, add the apple puree. Cook till the oil comes out, which takes about 7 – 8 mins on high. Make sure you keep stirring it. 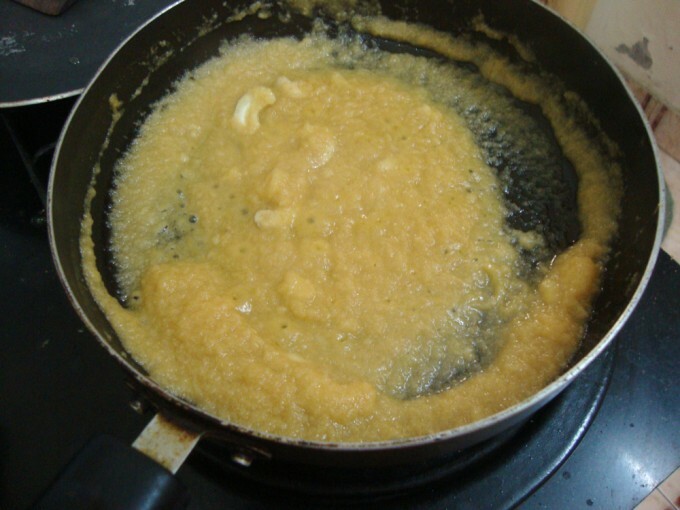 Then pour this puree over the simmering dal, Bring to boil once and switch off. 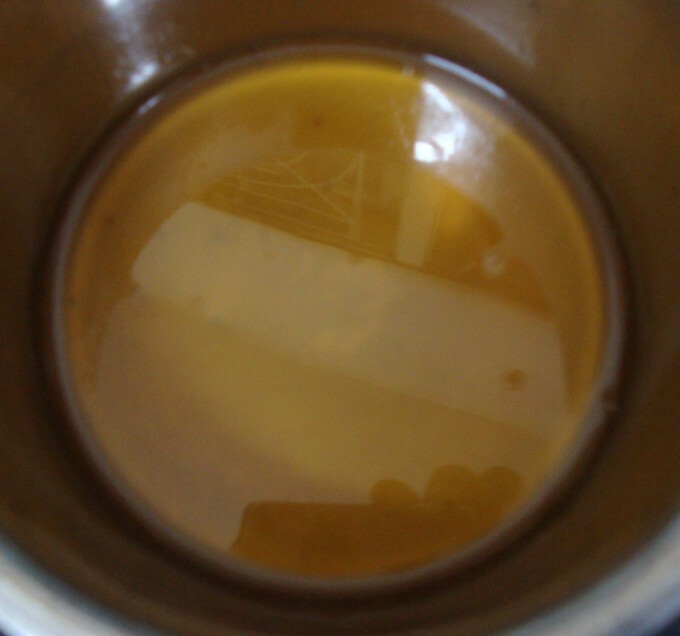 Notes: You may have noticed that the sweet was not much in the payasam, so increase if you want it more sweet. I was apprehensive on the fact that apple might have it’s own sweetness. Rather in the end, the apple flavour was not predominant when this payasam settled over hours. 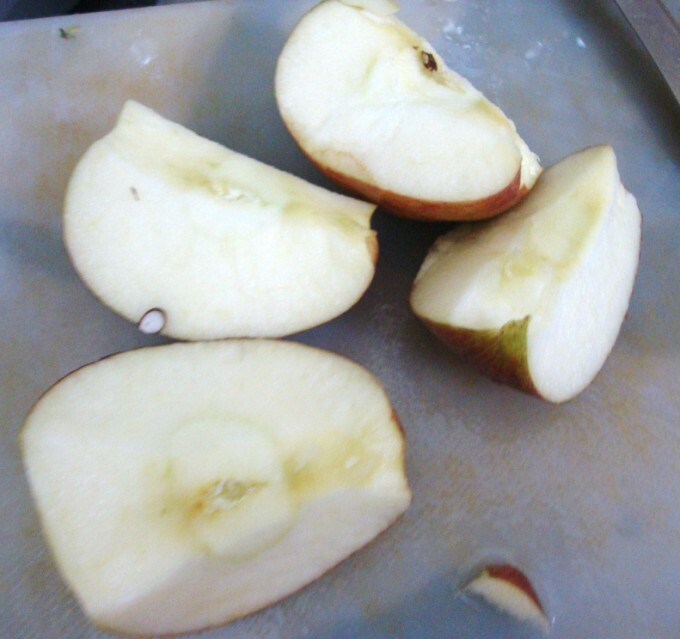 When I tasted in morning, the apple showed itself, whereas by afternoon, it got mellowed down. I know the days are becoming short with hardly any time for me to do much. But just as I love those days I do Blogging Marathon, I am loving this period, when one has to be more pious. Well this turns me into a religious person or not, I am surely very pious. Everyday is a learning experience.Life becomes more beautiful and with each day, brings you more awareness! Looks yummy! 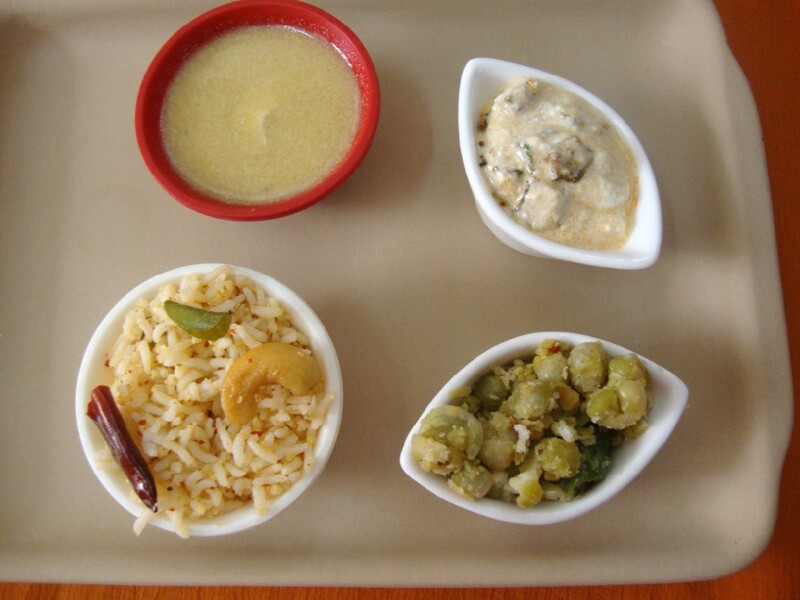 I especially love the apple payasam. Will make it next time I am making sweets. 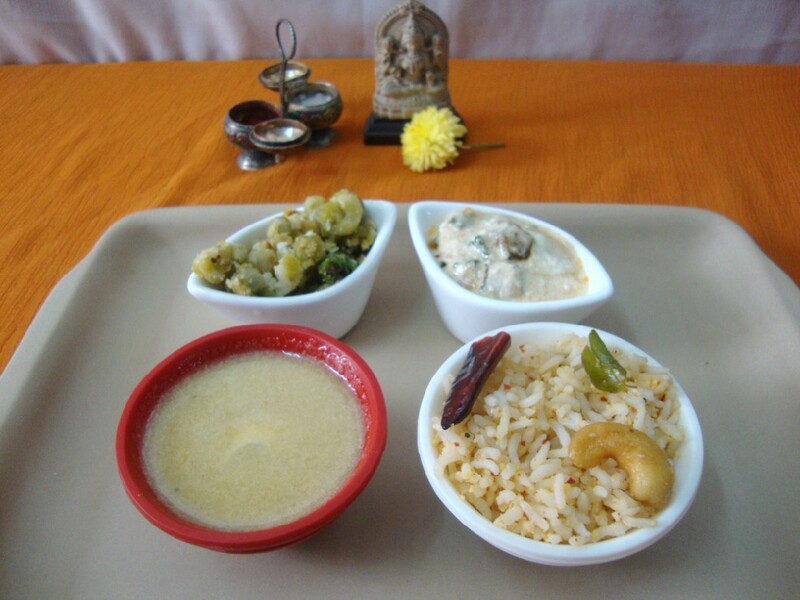 Ur really enjoying this festival…lovely dishes! Happy Navrathri Srivalli.Must try the apple dal payasam.Very innovative one. Love this whole meal…….goes great with the festival spirit.